It was a delightful day on the Isle of Skye in the Scottish Highlands. Sure, it rained most of the time ... I even got wet shooting this. But that's Scotland; if you want warm and balmy, go to Mexico. 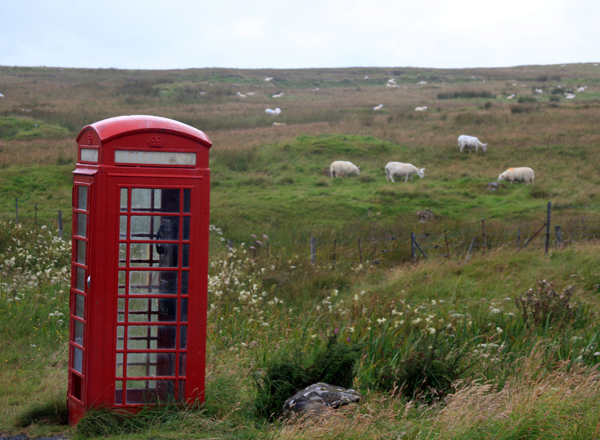 I love the old traditional red telephone boxes, still scattered around the world wherever Great Britain left its mark. On my first trip to Ireland and the Isle of man in 2004, we spent a lot of time in them when they were critical to our survival as we searched each evening for our next B&B. In 2011, with cellphones and international plans working, the red boxes seemed relegated to historical oddities. But I love them, especially this one in the middle of nowhere.